TeraFlex has a great reputation in Jeep circles – they make quality products that last. You’ll often pay a slight premium, but it pans out in the end (because you don’t have to replace a “budget” part). This 1.25 inch lift for your 2007 to 2016 Jeep Wrangler JK is no exception. There isn’t much to a body lift – some spacers to go between the frame and body and you’re done. 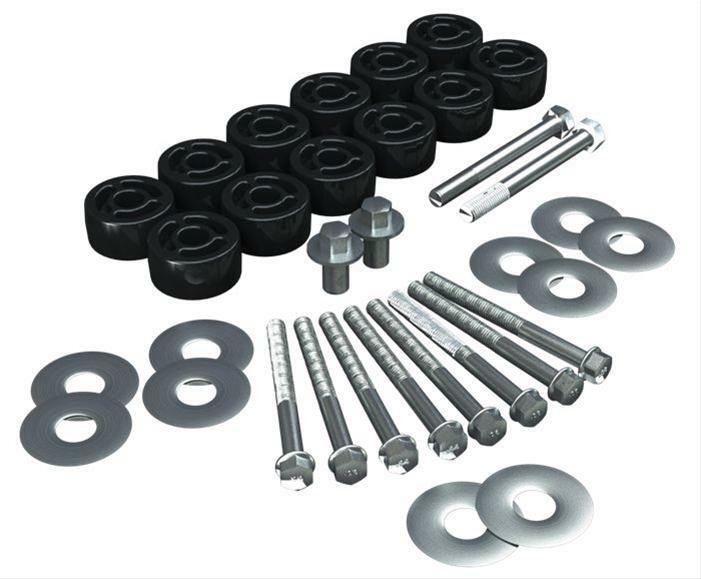 TeraFlex goes the extra mile by including all new bolts and washers – essentially everything you’ll need. The body pucks / spacers aren’t bad either, they are molded from UHMW polyethylene for premium longevity and corrosion resistance. Overall this is a great kit, and a solid buy if you want to clear 33 inch tires on your Jeep JK. This install is straight forward, You’ll loosen all the body mounts on one side, Jack up your Jeep, and replace the mounts, then do the other side. If you have a manual JK, then there is some trimming to the shift boot to be done, but nothing difficult, and the instructions walk you through this. The entire install will likely take you around 2 hours. Notes: No Grinding, Cutting, or Re-Purposing of Factory Hardware is Needed. Grill Removal is not Required.